1. Heat cream and milk with the scraped seeds of vanilla beans (let pods steep in cream for extra flavour). 2. Whisk together egg yolks, sugar and salt. 3. When cream has come just to a simmer, remove bean pods. 4. While whisking eggs, gradually add a little of the cream mixture at a time, until all has been mixed in. 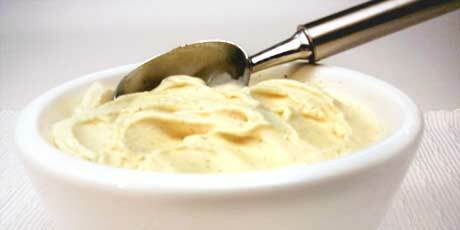 Reduce heat to medium low and return custard to heat, stirring until it thickens (or coats the back of the spoon). Remove from heat and strain. Chill completely. 5. Following manufacturer’s instructions, make ice cream as directed. Serve soft immediately, or let firm up in freezer for an hour before scooping.